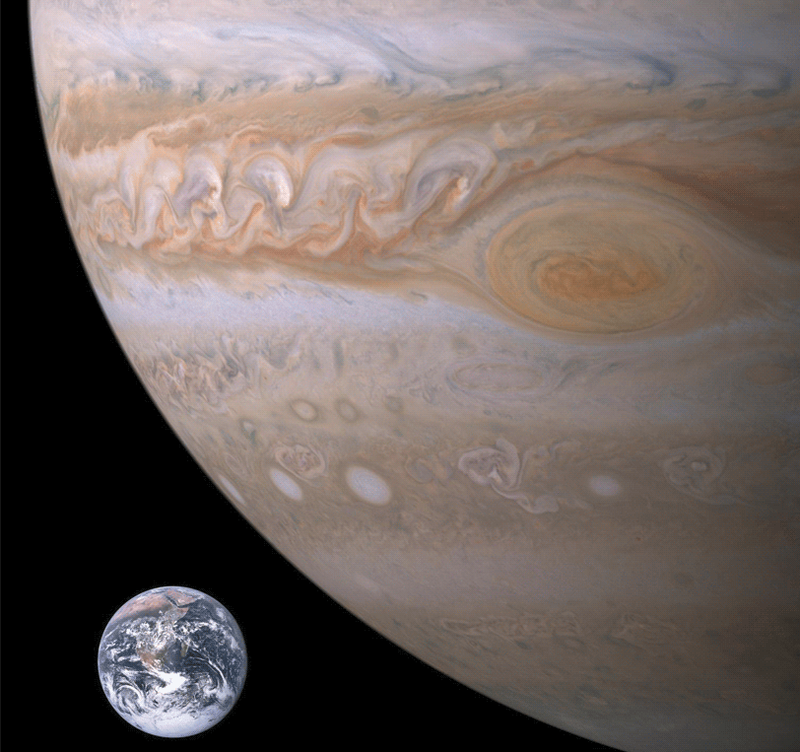 The raging storm known as the “Great Red Spot” on Jupiter could swallow up the whole Earth. Juno is a NASA spacecraft to help scientists to learn more about Jupiter. It is launched August 5, 2011, and it went into orbit around Jupiter on July 4, 2016. [The slowly spinning spacecraft orbits around Jupiter’s poles instead of around its middle. It swings far away, then back toward Jupiter, coming as close as 3,100 miles (5,000 kilometers) above the cloud tops]. It is named after the Roman god Jupiter. When viewed from Earth, Jupiter can reach an apparent magnitude of −2.94, bright enough for its reflected light to cast shadows, and making it on average the third-brightest natural object in the night sky after the Moon and Venus. Jupiter is primarily composed of hydrogen with a quarter of its mass being helium. In late February 2007, Jupiter was visited by the New Horizons probe, which used Jupiter’s gravity to increase its speed and bend its trajectory en route to Pluto. [Read more about the New Horizons probe here]. The average density of Jupiter, 1.326 g/cm3, is the second highest of the giant planets, but lower than those of the four terrestrial planets. Jupiter has the largest planetary atmosphere in the Solar System, spanning over 5,000 km (3,000 mi) in altitude. There are 69 known moons of Jupiter, but the largest moons of Jupiter are the Galilean four moons. [Read more about Jupiter’s largest moons here]. Ganymede is the largest and most massive moon of Jupiter in the Solar System. Also it is the largest moon without a substantial atmosphere. Ganymede has a diameter of 5,268 km and is 8% larger than the planet Mercury. 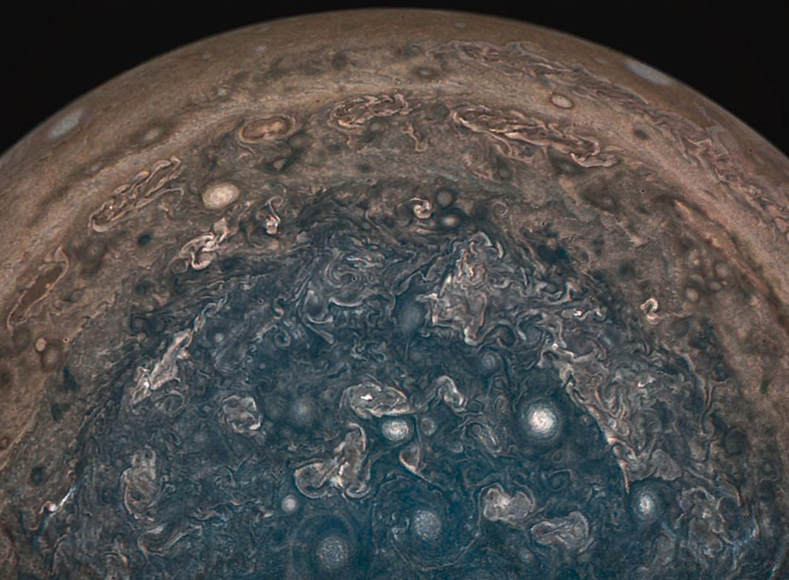 As mentions NASA “There is a lot about Jupiter we don’t know. 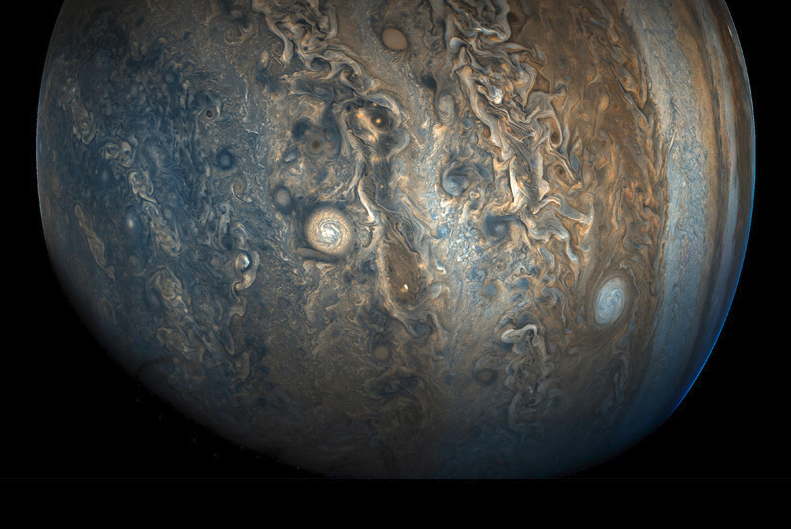 Scientists want to study Jupiter. They want to find clues to how Jupiter formed and has changed over the 4.6 billion years of our solar system’s life. That will also help them to understand the formation of our solar system and other planetary systems around other stars”. Next Next post: When Will Milky Way Crash into the Andromeda Galaxy?